With the temperature in the single digits and the wind chill causing it to dip below zero, it took a few hours of running the space heater to obtain a reasonable bit of warmth in the shop. I was able to get a couple of hours of work done on Saturday afternoon and then left the space heater to run overnight so I could work most of the day Sunday. 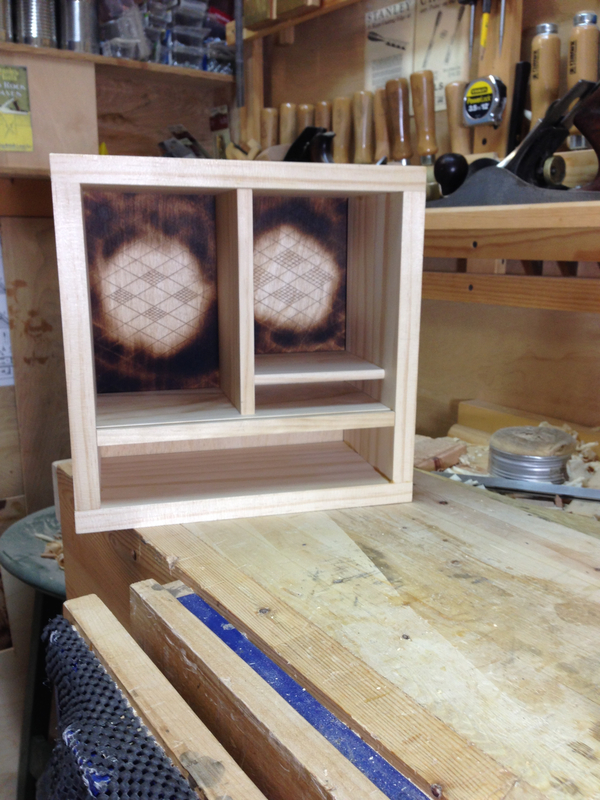 I added the small, inset shelf into stopped dados. 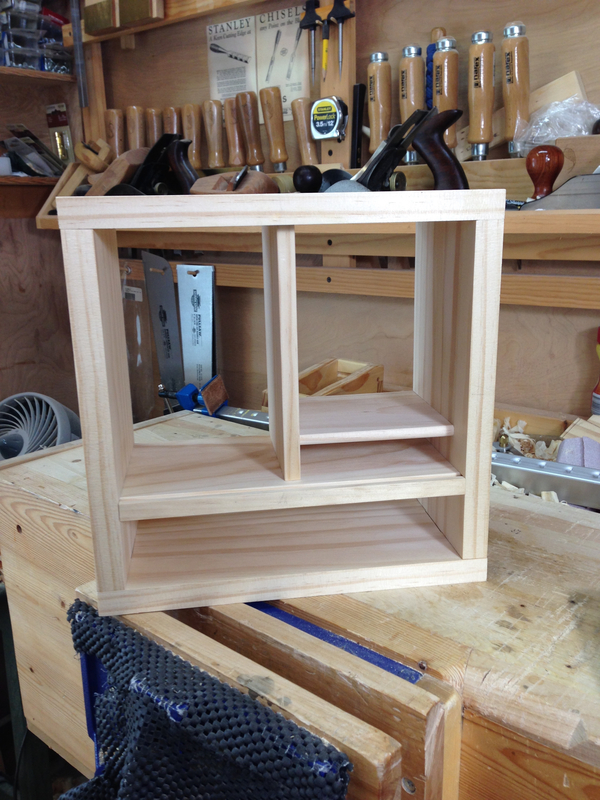 This shelf also delineates an area for a very small drawer. I then needed to add a rebate around the rear perimeter for installing the back. This is a thru cut on the sides and was easily done with my rebate plane. The top and bottom need to be stopped. I used two cutting gauges and a chisel to pull this one off. One gauge was set to width the other to the depth. several passes with each and a little chisel work had the job done. I then added the grooves for the sliding door. A simple operation with a plough plane. 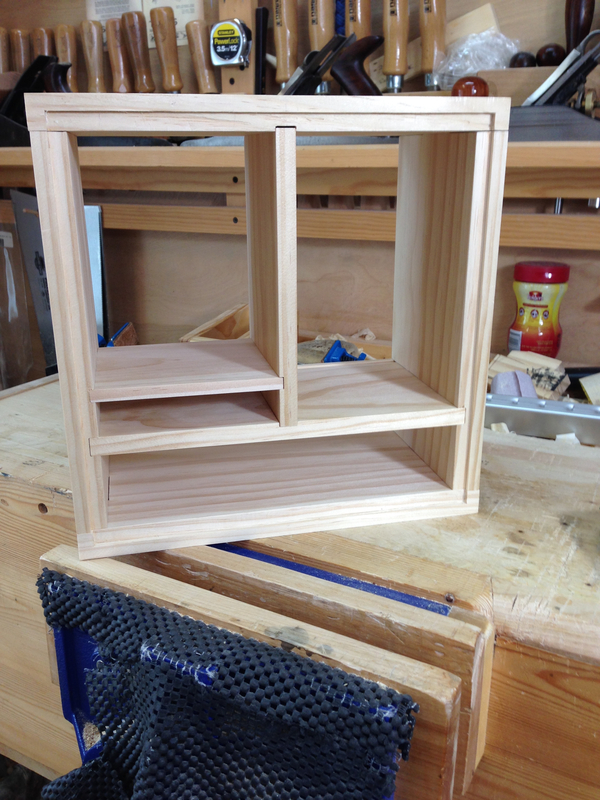 A dry fit with the divider and shelves in place. The rebate around the back. The gappy bits will pull up tight in the clamps. 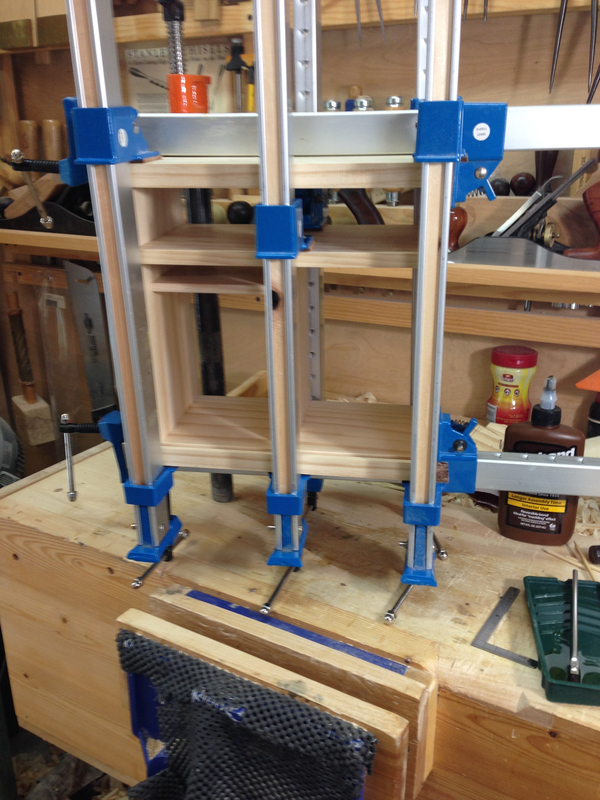 I need to buy some more clamps. Out of the clamps and bamboo pins installed. Plus a sneak peak at the rear panel progress. As soon as I can get back into the shop I’ll clean up the carcass and install the back. Once that’s done I’ll be able to start adding the Hillbilly Inlay. Thankfully this is something I can do in the house without creating too much of a mess. This piece is not only a trial run for this new design, it’s also a medium for experimenting with several Hillbilly Inlay designs and a couple other decorative techniques. 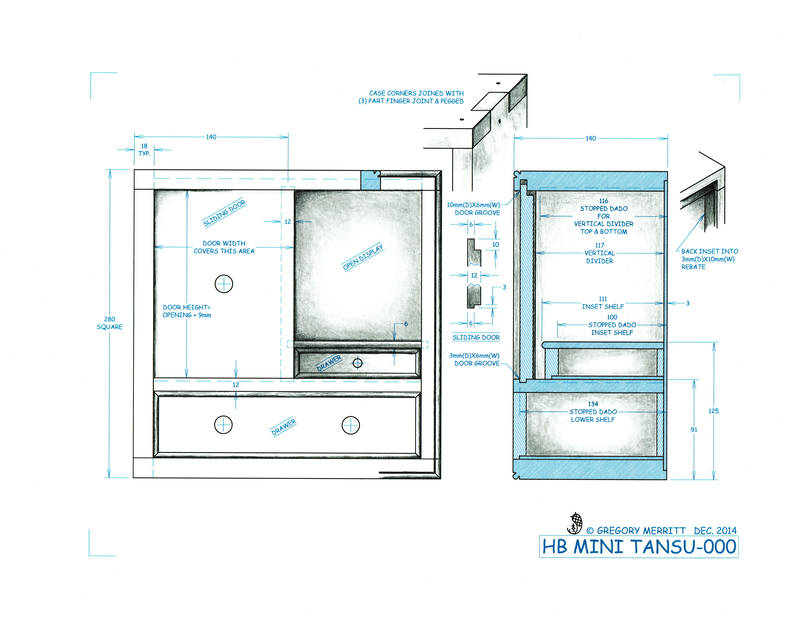 This entry was posted in Design, Hillbilly Mini Tansu-000 and tagged Hillbilly Tansu Project, tansu. Bookmark the permalink. This should be a good piece Greg, plus a chance to try out some new ideas. I hadn’t realized the size until I looked at the vise for scale. Thanks Joe. I plan to have a little fun with this one trying out a few ideas. I’m glad to hear that size was indeterminable without some sort of reference. That means I’ve done a decent job with the proportions. Is that a torched finish youve started? C’mon…. Were the same age… You can tell me. Doesn’t have to be a sneak peak. Haha. I plan to try a few ideas on this project. I may end up looking hideous, but at least I’ll know what works. Locally I can purchase radiata pine (clear) and something that is labeled as “white wood”. The white wood is much softer and somewhat spongy. Very similar to construction grade fir. So I almost always opt for the more expensive clear pine. The clear pine is denser and much easier to work with. The clear pine is a little more money but worth it. If I could purchase actual pine in the lesser, knot inclusive grades, I would. That is just not an option for me locally.